Modern comfort and an outdoor pool await guests at Hotel Neo+ Green Savana Sentul City, a 5-minute walk from Taman Budaya Sentul City. Providing free Wi-Fi and free parking, the hotel serves breakfast in room. Located in Sentul Town, Hotel Neo+ Green Savana Sentul City is a 20-minute drive from the centre of Bogor City and a 25-minute drive from Baranansiang Bus Station. 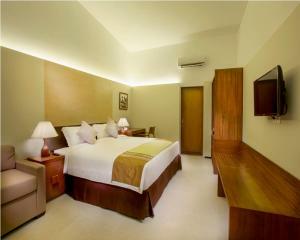 Air-conditioned rooms are decorated with brown tones and fitted with warm lighting. In-room comforts include a seating area, flat-screen cable TV and a fridge. 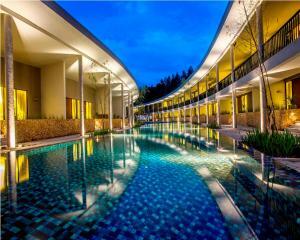 Select rooms provide direct access to the outdoor pool, while some rooms feature a private balcony. On-site conveniences include laundry service, area shuttle and airport pick-up arrangements. Staff at the 24-hour front desk can assist with safety deposit box usage and room service. mantabs gan… besar harapan semoga usahanya semakin laris, maju, lancar, dan berkembang dengan pesat….